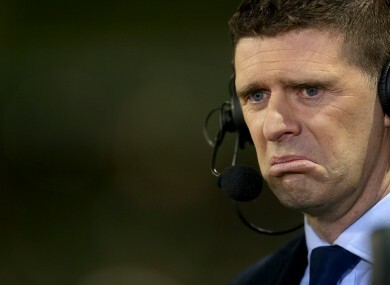 NIALL QUINN SAYS the League of Ireland must change its ways and stop being an easy target for English clubs seeking cheap players. A number of Irish footballers have been sold to English clubs for small fees, only for their value to skyrocket in a matter of seasons, he said. And their League of Ireland clubs are not being rewarded for their role in the development of the players. “Why would they pay a million pounds for a Ghanian player or players from other countries when our players don’t command a price we think they deserve. While chairman at Sunderland he highlights David Meyler and Roy O’Donovan as two examples of Irish players he felt they paid the appropriate amount for. “We respected it at Sunderland. But you look at some of the Irish players and the progress that they’ve made. And you would have wished that their former clubs had a sell-on clause or something. One of the League of Ireland’s brightest lights in recent memory, Richie Towell, this week confirmed a move to Championship table-toppers Brighton & Hove Albion. Quinn believes the former Dundalk man’s experience in Scotland as a teenager, with Celtic and Hibs, will stand to him and he is confident a mature Towell can succeed in the UK second time around. “”He’s a great advert for the League of Ireland. He went off as a young lad and it didn’t work out. He had to come back and fight tooth and nail as a footballer in the League of Ireland to get back to the UK. “He goes back a man. He’s no longer that 16-year-old boy, he’s less green behind the ears. He has all that experience now. He’s got that hunger and desire this time round to match what is his undoubted ability. Email “'League of Ireland clubs have to stop selling players short' - Quinn”. Feedback on “'League of Ireland clubs have to stop selling players short' - Quinn”.